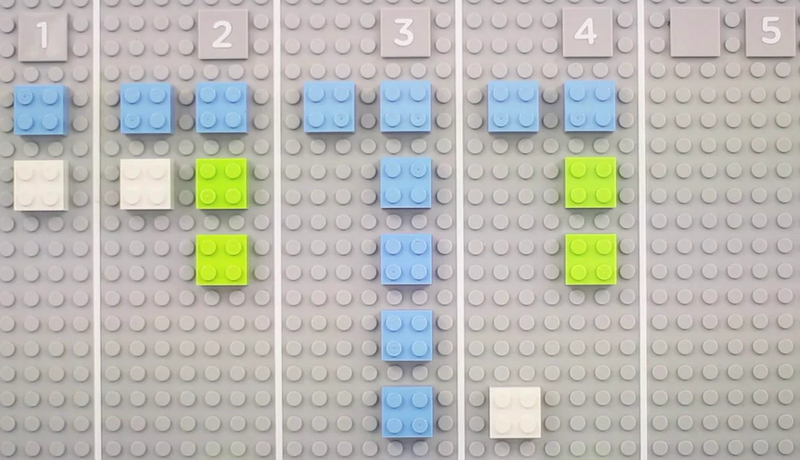 This lego board serves a particular need by a team in a unique way – like all the best board hacks do. 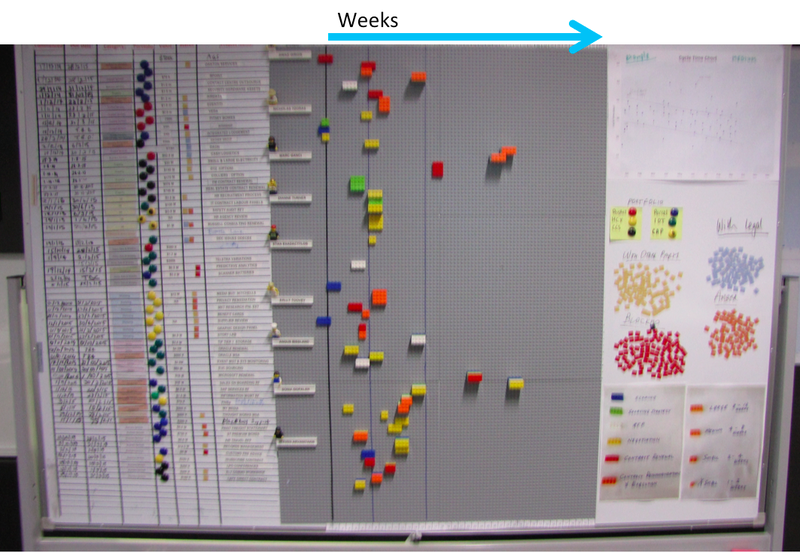 This wall is used by a procurement team for a large organisation as a place for conversations about the status of various procurement projects. As well as the usual conversations around current status, blockers, progress, the team wanted to have visual indicators that would prompt them to have conversations about how long a project had been running, what stages of procurement it had already been through, etc. The team started by quickly building a prototype wall using index cards with mail-merge stickers on them describing each procurement project. This information had previously lived in a spreadsheet. With the work quickly thrown up onto a wall, they asked themselves the question: “What is this wall not telling me?”. Answer: a lot! There were so many cards it was hard to see what was going on. They were hard to read. And the wall couldn’t tell the team anything about cycle time: how long was each project taking to go through the whole procurement process? Additionally, one of the team members had a visual disability, so the team wanted something with high contrast and large lettering. This was going to be hard to achieve with cards, given the number of procurement projects which were in flight at any time. With this learning, the team built a second board, this time from Lego. The left hand side of the wall is fairly familiar – a line for each project, with columns for portfolio (coded by colour), category and status, as well as the cost of the project. It’s over on the right that the fun begins. 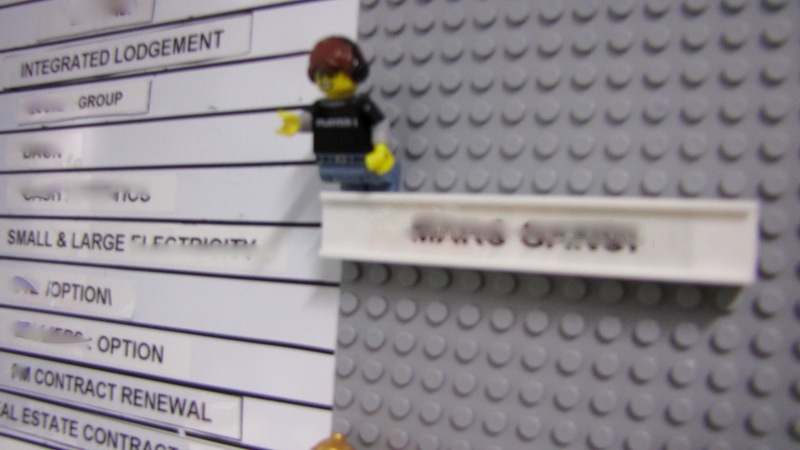 The grey lego base board is divided horizontally into sections for each team member – who is limited to no more than 7 projects on the go and has their own little lego avatar and a “one brick” row 2 lugs high for each project. Vertically, the board is divided into weeks. Team members get their own minifigs and each is limited to 7 lines and therefore 7 projects. 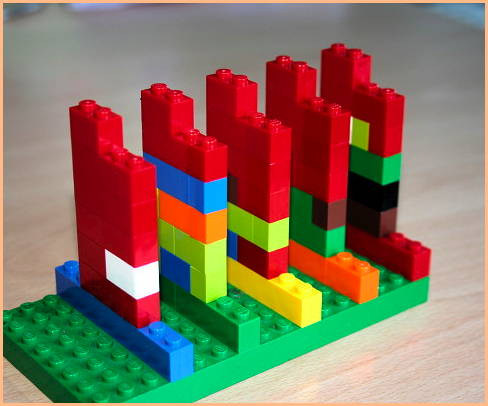 Each project is tracked using a lego brick. The size of brick indicates expected length of delivery of the project and the colour indicates the procurement stage that the project is currently in. Brick colour represents process steps. Brick size represents T-shirt – size estimates. 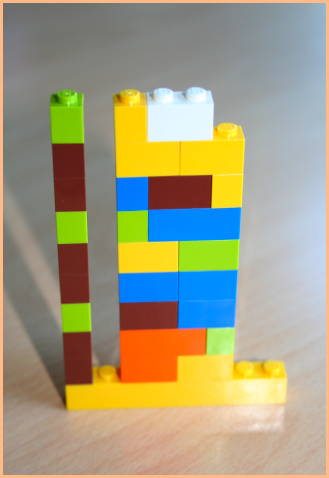 At the beginning of each stage of procurement, a project’s lego brick starts in week 1 and progresses on from there. At the end of each stage, the number of weeks spent is recorded on the edge of the brick using a sharpie, the appropriate colour brick for the next stage of the procurement process is stacked on top of the previous, and the stack of bricks goes back to week 1. 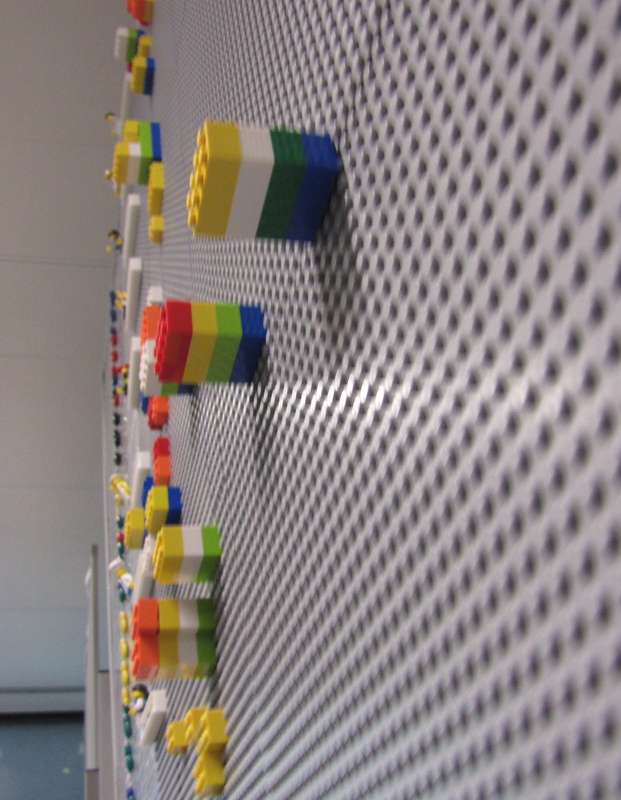 Each lego layer shows cycle time for a stage of the procurement process in weeks, together making up the whole project. Team members can read weeks of cycle time for each project off the scale at the top. how long in total it’s been on the go by quickly adding the numbers on the sides of the bricks. On the topic of 3d hacks, did you see this excellent calendar? Trying to keep track of time spent on different tasks. Or clients. Or projects. Maybe you have had this problem. I know I have. You want to do it easily as you go. We all hate timesheets, and trying to remember what we did all day. Imagine if it easy. Imagine if it was fun! Michael Hunger’s week, represented in Lego. Right there, that’s Michael’s week. Each row of bricks represents an hour, and each tower is a day. 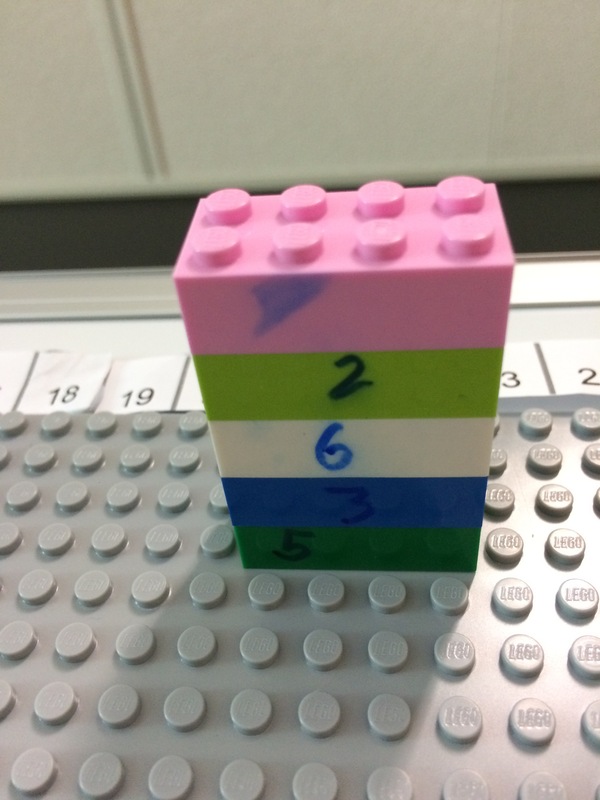 As he goes through his day, he uses the coloured blocks to represent the project he’s working on (the box of lego came with 8 colours, and he figures thats enough to cover his projects). As he goes hour by hour, he adds the coloured bricks to the row for that hour. And builds up his day. The sizes of the bricks allow Michael to track in 15 minute increments, which should be enough. 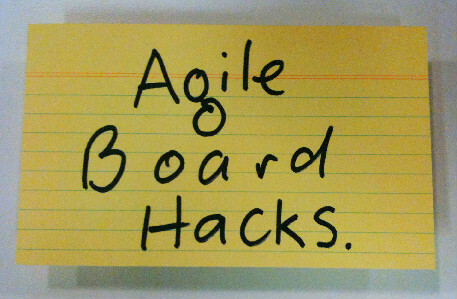 Read the full details about this hack on Michael’s excellent blog, Better Software Development.